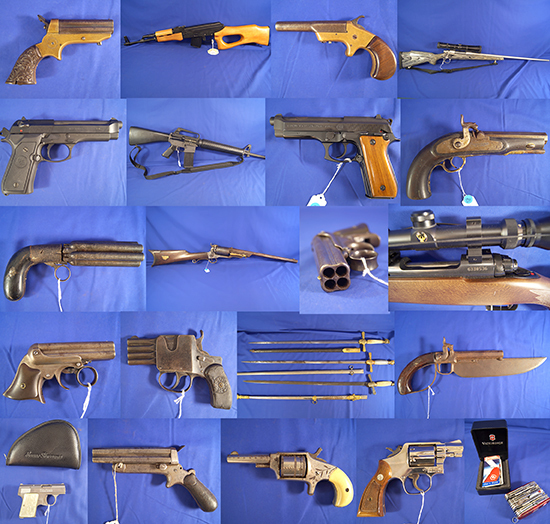 9 AM auction start: Over 250 lots of Firearms, modern & vintage etc. Live in person bidding + Online Bidding. Some Misc box lots are only available to in-person bidders and are marked as such. Payment Instructions: Accepted methods of payment for this auction are: Cash, Check, Money Order, PayPal, Card on file with Proxibid or call our office with credit card. If you are mailing in a payment, you must email us within 48 hours of auction close that you are mailing in a payment. Please email liz@premiereauctionsgroup.com. There is a 15% buyers premium on all items sold. If you are paying with PayPal or Credit Card, there is a 3% processing fee that is added to the invoice total. If you do not notify us within 48 hours of auction close that you are mailing in a payment, the card on file with Proxibid will be charged for your invoice total. Shipping Instructions: Our goal is to provide our customers with quality collectibles, guns and artifacts with reasonable shipping fees. Our standard method of shipping is via USPS Priority Mail with Delivery Confirmation on non-firearm items. Shipping charges are based on Priority Mail with Tracking. Shipping on Firearms is generally through UPS. Insurance on ALL items is only added upon customer request and the customer is charged the actual insurance price. Once the package is in the hands of the Post Office or UPS or FED EX, Premiere accepts no responsibility for damage or lost packages. We will combine as many multiple lots of smaller items as is safely possible in each box in order to minimize shipping fees. Please see additional information on shipping Firearms in the Terms and Conditions section. Preview Date & Times: Auction day - 8:00 am - 10:00 am. Auctioneer has final say on determining which bidder is the high bidder. Auctioneer has final say on resolving any bidding disputes, and any decision to re-open bidding is at his sole discretion. Premiere Auctions Group, LLC reserves the right to refuse admittance and/or participation in this auction to any individual or group. Ohio State Sales Tax of 7.0% will be applied to all sales unless a tax exemption certificate has been completed and signed prior to the close of auction. Out of state sales tax numbers will be accepted. Ohio State sales tax will not apply to any items which are shipped out of state. Bidder shall be the sole judge of value. Bidders who bid from off site and are not present at the live auction or preview understand and acknowledge that they may not be able to inspect an item as well as if they examined it in person. It is the Bidder’s responsibility to determine condition, value or any other determinative factor. Premiere Auctions Group, LLC shall endeavor to describe in detail each item and any pertinent information about it. Premiere Auctions Group, LLC will not be responsible for any errors or omissions in the description of the merchandise unless it is a material misrepresentation of the item itself. Premiere Auctions Group, LLC is providing Internet and/or live internet bidding as a service to Bidder. Bidder acknowledges and understands that this service may or may not function correctly the day of the auction. Under no circumstances shall Bidder have any kind of claim against Premiere Auctions Group, LLC or anyone else if the Internet service fails to work correctly before or during any auction. Premiere Auctions Group, LLC will not be responsible for any missed bids from any source. Additional TERMS AND CONDITIONS OF SALE 1) CONDUCT OF AUCTION. This auction will be conducted by Premiere Auctions Group, LLC. (the Company), under the following Terms and Conditions. Please read them carefully. By accepting a bidder number and placing an electronic bidding through Proxibid you ARE accepting and agreeing to abide by these Terms and Conditions. 2) BUYER'S PREMIUM. A Buyer's Premium of 10% for live floor bidding, and 15% for all online purchases will apply. There is an additional 3% fee if payment is made through PayPal or with a Credit Card. This fee does not apply to those paying with cash, check, or certified funds. The Buyer's Premium is added to your successful bid. 3) PAYMENT AND 3% CREDIT CARD/PAYPAL FEE. Payment terms are cash in United States currency, check, MasterCard, Visa, American Express, Discover, PayPal. Checks from only United States banks are acceptable. Any other arrangements for payment must be made in advance of sale. There is a 3% fee in addition to the 15% Buyers Premium for payment made through PayPal or by Credit Card. It is assumed online customers will be paying with their card on file with Proxibid. If you prefer to use a different credit card than the one on file, or if you wish to mail a check or money order to avoid the additional 3% fee – you must email liz@premiereauctionsgroup.com or call our office at 419-207-8787 within 48 hours of the sales close. After 48 hours from the sale close, all credit cards on file will be processed unless email or telephone notification has been received. 6) RESERVES. Some items in this sale may be reserved (that is, subject to a minimum bid). The Company reserves the right to and may implement such reserve by bidding on behalf of the consignor. Consignors may not bid on their own items or have any agent bid on their behalf. If any such bidding is recognized, we reserve the right to withdraw any or all items consigned by that consignor. 7) WITHDRAWAL OF ITEM, DISPUTED BID. We reserve the right to withdraw any property that has a reserve against it prior to the final announcement by the Auctioneer that the item is Sold. Items sold without reserve may be withdrawn at any time up to the Auctioneer's call for bids on the item (unless no bid is made within a reasonable time). No liability may be asserted in connection with withdrawal of any item. 8) AS IS, WHERE IS. Except as specifically provided in paragraph 9 below, all items are sold as is, where is, with no guarantee or warranty whatsoever, including but not limited to, any warranty of merchantability, condition, value or fitness for any purpose. None of our employees, agents, or consultants are authorized to make any guarantee or warranty or binding representation. 9) CATALOG DESCRIPTIONS AND QUESTIONS. Bidders are strongly urged to personally inspect each item on which they intend to bid and to base their bids solely on their own opinions. While we strive to write accurate descriptions on all lots, catalog descriptions may not include all of the details a buyer may seek and thus bidders are encouraged to view all photos carefully and to email or call us with any additional questions prior to 48 hours before the sale start and before placing bids. Questions can only be answered M-F 9am – 4pm (est). Email jim@premiereauctionsgroup.com or call 419-207-8787. 10) It is recommended that all firearms purchased at auction be inspected and approved for use by a competent gunsmith before firing. We expressly disclaim any liability whatsoever for accident, injury or damage resulting to any person from the storage or subsequent use of any such lot. 11) SHIPPING AND REMOVAL OF FIREARMS. *** It is the buyer's responsibility to verify local and state gun laws. *** Subject to the Buyer's compliance with all applicable laws for the delivery of a firearm, all purchases are final upon the Auctioneer's pronouncement of Sold, and the Buyer assumes all risks and responsibility for the purchase at that point. Curio & Relic firearms may be removed from the premises if you hold a current federal firearms license and meet all legal requirements for removal. All post-1898 firearms must be registered, as well as pre-1898 firearms that are required to be registered, per paragraph 13 of these Terms and Conditions. Upon your request, and after payment has been made and registration requirements, if any, have been satisfied, we will release your purchases to the person you specify, provided such release complies with law and such person has whatever documents are reasonably required for such release. We can arrange packing and shipping of your purchases by our staff or through outside agents, at your expense, plus a charge of $5.00 per box shipped. (When reasonably possible, we will combine lots to minimize the number of boxes needed.) For out of state or non-local bidders firearms can be shipped to the FFL dealer of your choice. Current copies of the FFL must be received before your items will be released to our shipping and receiving department. All firearms are typically sent by UPS Ground. We will make every effort to ship your items as economically as possible without compromising the protection of the shipment. It is the buyer's responsibility to fax or email a copy of their FFL with each order. Please allow up to three weeks for shipping. Your order is not released to our shipping department until all payments, FFL and/or other necessary documents are received. 12) International Bidders: We will not ship any firearm, whether modern, antique or curio outside of the United States. 13) REGISTRATION. ***It is the buyer's responsibility to verify local and state gun laws. *** All firearms requiring registration must be registered in compliance with all applicable laws. Buyers of registerable firearms can complete state and federal registration at Premiere Auctions Group, LLC, 471 US HWY 250 E BLDG “D” ASHLAND, OH 44805 unless otherwise specified. A ten-day waiting period is mandatory for most guns. Dealers must present all proper paperwork and a signed copy of their current Federal Firearms License along with a release number from the Department of Justice, if required, in order to accept same-day delivery of modern weapons. After registration, all firearms must be picked up within thirty (30) days or they must be re-registered with appropriate fees and waiting periods that are applicable. For out of state or non-local bidders firearms can be shipped to the FFL dealer of your choice. Current copies of the FFL must be received before your items will be released to our shipping and receiving department. 14) DISPUTES ON BIDS OR BIDDING. In the event of any disputed bids, the determination of who was the successful bidder, or as to any other disputes as to bids or bidding, the Auctioneer who auctioned the item at the time shall be the sole determinant as to who is the successful bidder and for how much, within his/her sole and exclusive discretion, which may include re-offering the item for sale and re-selling it. THIS LOT WILL BE AVAILABLE TO FLOOR ONLY BIDDERS - THANK YOU!